British Christmas traditions: the brussels sprout | Notes from the U.K.
Health and Safety Warning: This post contains exaggerations that may be detrimental to your mental health. Or your credibility if you take them literally when linking to the post. The Druids did not actually worship brussels sprouts. No one knows much about what the Druids did. And with that out of the way, do read on. What is it about the British and brussels sprouts at Christmas? I address this topic because judging from my search engine queries it’s what people want to know. Or at least what one very determined person wants to know. Within a few days, I had at least five variations on the question Why do the British eat brussels sprouts at Christmas? It may have been more. I lost track in there somewhere. Why the person kept coming back if I hadn’t already managed to answer the question I don’t know. Determination shading into obsession? Anyway, the question matters, and I’ve addressed it before but I don’t feel I did it justice. Because I sidestepped several crucial facts. First, if Google is to be trusted (it’s not) you can spell the vegetable with or without an S: brussel sprouts or brussels sprouts. The first spelling matches our pronunciation (we just can’t make the double S audible unless we say it while standing on our heads and gargling salt water). Besides which, it’s easier to type without the extra S. The second spelling replicates the name of the city where they didn’t originate. According to Brussels Sprouts Info (everything important has its own web site these days), they’re believed to have been grown in Italy as far back as Roman times and began to be grown on a large scale in Belgium as far back as the sixteenth century before spreading outward from there. The more common spelling seems to keep the extra S.
Second, you can either capitalize the B or not, depending on whether you capitalize the F in french fries. I don’t, but Word does and gives me bad marks every time I go back and un-cap it. It’s easier to use a cap, which is probably why I don’t. It’s a small and pointless way to fight the monopolies that are taking over our spelling. Not to mention our lives, economy, and politics. Take that, monopolies: I’m using a lower case F and a lower case B. That sound you hear? It’s Microsoft crumbling in the face of my defiance. Third, the world contains more than 110 varieties of brussels sprouts and I bet you can’t tell any one of them from the other more than 109. You notice how vague they are on the actual number? It’s probably because someone’s out there devising a new variety even as I type. What did the Druids worship? The Great Brussels Sprout. They painted themselves blue and cultivated the sacred plant. And they were nekkid when they did it. How’d they cultivate it if brussels sprouts didn’t yet grow in the British Isles? I did say Google couldn’t be trusted. Its sources are giving you the official history. You can only find the truth by going into the dark web, where danger lurks behind every pixel, so I don’t dare give you any links. Folks, I’ll take the risk myself but I can’t be responsible for your safety. You’ll have to find it on your own or trust my report: The truth is that the Romans quietly exported the brussels sprout from Britain to Italy, and once it was established there they claimed to have developed all more than 110 varieties themselves. Back in Britain, the Romans suppressed both the Druids and all outward forms of sprout cultivation and worship, but the belief ran deep in the population, and it survived, waiting from the sprout’s return. How’d it do that when the pre-Roman British tribes (the Iceni, the Caledones, the Parisi, the Cornovii…) were overrun by the Angles and the Saxons and the Vikings and the Normans, making for a choppy history and a messy but interesting language? Because knowledge of the Great Brussels Sprout is planted deep in the soil. You don’t have to learn it from your community. If you get yourself a shovel and start digging, it works its way into your bloodstream. You feel a compulsion to worship something green and brassican. Rumor has it that they made do with cabbages until the brussels sprout was re-imported and jogged their memories of what the Great God really looked like. These were agricultural people, remember. They had lots of shovels. So when Christianity became the dominant religion, the best it could do was drive sprout worship deep underground, and from there it rises, godlike, every year. Do I consider it strange, you ask (or at least you should ask), that people eat the sprout they worship? Isn’t that a bit, um, grotesque? Not at all. The Great Sprout is the essence of all sprouts and is itself inedible. The sprouts people eat at Christmas are merely its representation. And those among us who claim the ones on the plate are also inedible? They’re closest to the holy nature of the Great Brussels Sprout and everybody should back off and stop giving them a hard time. Fifth (we were counting, remember? ), the brussels sprout ripens around Christmas time. How many other vegetables are willing to do that? So of course people eat it. And on a marginally sensible note, last week I forgot to link back to Laura, at A PIct in PA, who first used to word tickety boo, giving me a great excuse for another important post. She’s a Scot living and raising her kids in Pennsylvania, and she keeps a fine blog with lots of nifty artwork. This entry was posted in Food, Holidays and tagged Americans in Britain, Americans in England, anglophile, Britain, British Christmas, British food, brussels sprouts, Christmas, England, food, humor by Ellen Hawley. Bookmark the permalink. I had to go back and see what point 5 was. I only wrote the thing. You can’t expect me to remember it all. You’re right, though. That probably would cover it. In any other country. That’s the beauty of British-ness! So let me say here and now that I sent that “eat sprouts” tweet before I read this. And after I swore to Mick Canning (above; or below; I’m not responsible for how I set this mess up) that I’d never try to impose them on anyone else. Don’t eat sprouts. Eat cranberry sauce. Eat anything you like. Enjoy the holidays. Would you believe I have a bag of said sprouts in my freezer and I’ve just recently developed a hankering for them. This is proof of what you say in your divine post. As a side note: If you want to make Microsoft scream, use Linux. I do and I just tried typing “french fries” and “brussels sprouts” in LibreOffice. I was unsuccessful when I typed these as the first words in a sentence, but typing again in the middle of a sentence produced only a wavy red line beneath “french” and “brussels” and I’m pretty sure that line goes away when the document is printed or made into a pdf. I’ve never tried Linux but assumed it was for people with better computer skills than mine. I do know that the wavy line will go away in PDF or print, though. Sounds like a you-spelled-it-wrong warning, which I get in Word as well, but Word also caps the things for me so I have to go back and uncap them. Damn, I’m stubborn. Maybe I should try Linux. Linux is no longer hard to use, but you can run into problems if something goes wrong, because you will find that not many of your friends can help you like they can with Windows which they use. In reality, LinuxMint which I’m using is probably easier to use than Windows. This is especially true for me since I have no idea how to use Windows 8 on up. But, you can maybe try LibreOffice which comes in a Windows flavor. I think it pretty much works like Word. The nice thing is that there are fairly frequent upgrades at no cost. They do accept donations. When you go to the site, it should pick the right version for your system. Truth is that you probably have enough on your plate right now and will save a lot of time just forcing Word to do your will. Maybe think about LibreOffice when the next version of Word comes out and wants your money. Thanks for saying that. You’re right: The last thing I need in my life right now is a new computer program. And when they offer to sell me an upgrade, I promise to ignore them. I always do. The only time I upgrade is when a computer dies and I have no choice. Or else they stop supporting a program because it’s so old it’s still using cuneiform. When that happens, I’ll reconsider. Fascinating. I love the sprouts. I am alone in that, at least in my family. 🎄 Nice shout out to Laura and her “tickety boo”. Ah, well, if the family doesn’t like them that leaves more for you. No, I’m afraid we have to agree to disagree, here. Ghastly things, brussel sprouts. They’re not something I’d try to impose on anyone else. Honest. I eat Brussel Sprouts all year long. I love a Brussel Sprout sandwich (mixed with a little salad cream) and they also goes very well in Bubble & Squeak. I’m very thankful I don’t have to peel them though. I thought I was the only person who ate brusssels sprouts sandwiches. We should form a club. Elect officers. Collect dues. Wonder what to do with the dues we’ve collected. Split into factions and fight over whether to use salad cream or butter, white bread or whole grain. My mother never peeled brussels sprouts but she did pull off a few outer leaves and cut a smidgen off the bottom. I spent years doing the same before I realized they were just fine without all the fussing. I have no idea why she did that. Did your mother ever put a cross on the bottom of each sprout? I remember both my mother and Grandmother doing this. Something about by doing this then the sprouts would cook more quickly. I’d go the Marry Berry recipe and just cut the sprouts in half and then boil them. Has to be thickly cut white bread for the sprout sandwiches. Perfect for Boxing Day or a light snack instead of the turkey sandwich on Christmas night. My mother didn’t make a cut on the bottom, but I’ve read serious cooks (my mother wasn’t one of them–she could put a meal on the table but never enjoyed cooking and was no expert) who recommend it. I’ve tried it and noticed no difference so I don’t bother. But here we get into faction-fight material: Whole grain bread (I tend to make my own, she said without a trace of braggery). Thick slice, buttered, but just one, so an open-face sandwich. That means the sprouts have a habit of falling off, even when they’re sliced in half and put on flat-side down, so I add them one at a time. Great lunch any time of year. I agree, although I tend to mash them up and spread them on the bread rather than cut them in half and hope they don’t fall out. I think a Brussel Sprout lovers club is called for. I like brussel sprouts. Our local tavern/restaurant features grilled brussel sprouts as an appetizer and they are quite good. This new information begs the question: does the Green Giant brand, complete with their Jolly Green Giant and is faithful sidekick Sprout, represent idolatry? I’m not sure about idolatry. I mean, they’ve taken the greatest of Great Sprouts and personified it as a sidekick. This is serious blasphemy. And the Great Brussels Sprout will surely rain blessings on your house. I can’t predict, of course, what form they’ll take…. So I can put it in the same category as haggis? Sometimes people just eat things because they don’t want them to go to waste? Or the English Channel/North Sea does strange things to the appetite? I can’t really explain the whole haggis thing. But then I live as far from Scotland as it’s possible to get without wading. It could be the Channel, the North Sea–all that salt water and seaweed. That’s as good a theory as any other. Thanks for the mention, Ellen. Not necessary but very kind and thoughtful of you. You can count me among the Brits who do not like Brussels sprouts. I am actually not big on any member of the cabbage family. I do sometimes eat red cabbage cooked with apple in the winter but otherwise eating cabbage is something I endure rather than enjoy. Adding to the long list of things that make us a chalk and cheese couple, my husband adores sprouts. He eats them all year round and – like Hugh above – he likes them with salad cream. If he is being fancy with them, he has them with bacon and chestnuts. But mostly just salad cream. He recently convinced me that all of our kids liked sprouts so, fool that I am, I cooked them up for last night’s dinner, making quite a stench in the kitchen, and it transpired that only one of my kids likes them. He loves them while his brothers detest them and would not even try one. My husband came home to lots of leftover sprouts which I assume was his plan all along. As for the why they appear on Christmas dinner plates, I assume it is simply that the sprouts are ready to be harvested at this time of year. If your husband doesn’t decimate the leftovers, you could always decorate the tree with them. They’d look nice. Although they’re a brighter green (and less stinky) when they’re raw. You’re more than welcome for the mention. I really had meant to do it in the original post. I’d even run through the scheduled post, looking for whatever it was I knew I’d forgotten, but nothing jogged my memory and I gave up. Sigh. My life would be entirely different if I had a working memory. I love ’em. When one of our granddaughters was little she liked them wrapped in sweet papers. How funny. I used to work with someone who swore kids are all from some other planet. Brussels sprouts were introduced into Britain during the reign of Henry VIII by the Huguenots (Protestants) who came over to escape the religious wars in France (including Belgium). They brought many of their herbal gardening and culinary skills with them, including juniper berries and fried chipped potatoes (French fries) etc. Only the rich households ate them at first. They became part of the traditional Christmas Dinner during the Victorian Era – our Christmas dinner has not changed much since the Victorian times, mainly due to Charles Dickens writing so much about the Victorian Christmas – that this has always seemed the ideal and very much a tradition. 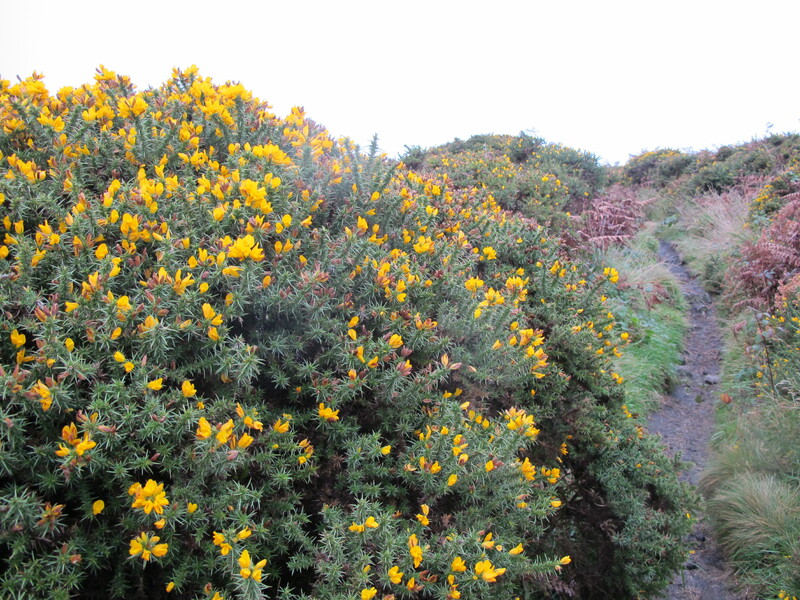 As for the Gorse you have taken a beautiful photo of, there is an old saying (in Hampshire anyway) that: “when gorse is in bloom, kissing’s still in fashion”. A bit of good sense just made its way into the discussion, and none too soon. It’s interesting background. Thanks. I do love your blog. It is so good to read about Blight from a similar but different cultural perspective. You must feel like you are living in a parallel universe? As for the sprouts, I remember going to a Belgian restaurant and the only vegetarian (which I was for 35 years but no longer) option was pasta with Brussels sprouts. My sad face soon lifted though – it was fantastic. The secret I was informed was only to let them boil for 3 minutes, cut them in half, then when ready to serve lightly fry them. I have tried this in Chinese-style cooking with soya sauce and it works! Pasta with brussels sprouts, I think, would leave my face looking like yours did. I’m glad it was better than it sounded. I began eating vegetarian food back in the seventies, when the plan was to leave out the meat, leave out the taste, then serve it. When I gradually stopped eating meat altogether I did my best to find some other approach to it, because I do love food. I’ll try your approach one of these days. Parallel universe? Not exactly. It’s all starting to feel fairly normal. Until, of course, something happens to remind me that Toto and I aren’t in Kansas anymore. Ha Ha. Follow the yellow-brick road. I will. As soon as it stops raining. It’s odd that I’m reading this today — last night I ate the most amazing Brussel Sprouts I’ve ever had. Roasted with a little sprinkling of balsamic vinegar. And you have made me want to go back to that restaurant and have them again :-). The newspapers are full of recipes for roasted brussels sprouts at this time of year. Roasting is a very British thing to do with meat, potatoes, vegetables–with pretty much everything but the dishrag. I’m not above eating a roast potato or six, and I do like them, but it always strikes me as more energy than I want to put into a meal. Which is strange, since I’ll do other complex things in the kitchen. Maybe it’s time to reconsider my biases. Love my Brussels sprouts! Ever since a college dorm roommate introduced me to them cooked in a hotpot back in the early 70s. Smothered in butter. Yikes! Have I just aged myself! (Not to mention the 10lbs I gained that year. Bagels with cream cheese, etc. Cafeteria food was deadly.) Before that, I didn’t know what a fresh vegetable was. My Mama embraced frozen vegetables big time. Anyway, thanks for a wonderful post. I think our generation of mothers must have almost all embraced frozen vegetables. They were simple. They were better than canned. All those little squarish packages you could just stack up and reach for. Progress! Years, not ‘hears’. Sorry, lately I seem to make a lot of typos… Sigh. Blame it on the sprouts. They can’t fight back. Some law of physics keeps us from seeing our typos on other people’s blogs until we hit Post and they disappear irrevocably into the blogosphere. It’s true! Haha… Hope you are enjoying the buildup to Christmas, and I wish you a very merry one and a great New Year! (Personally I can’t wait, this one was a toughie)!! I won’t mind seeing the back of them this year either. May next year be easier on both of us. So much to learn about Brussel Sprouts or Brussels Sprouts, my head is spinning. I had no idea of the importance of BS (Brussels Sprouts of course) across the pond. And then there is the Great Brussels Sprout secret god of Brits or Druids or whoever, clearly this is a well kept secret. However, this very good BS post missed being a great BS post. On the point of consuming BS at Christmas in representational reverence of the Great BS god, would this not be a form of communion? In fact, could the Church have ripped that off from the Great BS worshippers? Just asking. I think you still have some research to do on this topic. I think you’re on to something here. More research it is. Or possibly a few hallucinogens. I think it’s wonderful your brussel sprouts article got such attention. I didn’t know they were such a big thing in England either. Well, when you write about the important things, they will get attention. I used to hate Brussels sprouts, then in my 20’s and 30’s I loved them, and now in my dotage I don’t like them again. My daughter has always hated them. When she was small I used to tease her at Christmas time by telling her that when I drove into my local town centre to do Xmas shopping, I was held up by the queue of lorries (US: trucks) bringing container loads of sprouts to the Waitrose and Tesco supermarkets. We still buy sprouts every Christmas, because my wife likes to make Bubble and Squeak (http://www.bbcgoodfood.com/recipes/164622/bubble-and-squeak) – just about the only way I can tolerate eating them. They’re supposedly best when the frost has been on them for a while before they’re picked – makes them sweeter and less bitter. Trouble is, we’ve had very mild weather leading up to Christmas in the UK for the last 9 years out of ten – no frosts to be seen in the south at least! As I worked my way toward your last sentence, I was wondering where I’d have to go to find a frost. Thanks for the bubble and squeak recipe link. Someone is sitting in the U.S. at this very moment wondering, Bubble and what?? ?, and will be grateful. Whew. You only just got over here in time. I love the humor in this post. And I love that I was infinitely fascinated by it. Brussel sprouts (I’m American, so… we do everything wrong) were about the furthest thing from my mind this morning, but here we are. This is why I love the internet. Legitimately, though, I loved this, and wanted to wish you a very merry Christmas and happy new year! And all the same to you. Glad you ended up someplace you didn’t expect to–and enjoyed the trip. You’re right–that’s the internet for you. Thanks for stopping by and reading an–even for me–fairly bizarre post. OMG funny! I always thought I hated bruessel sprouts until I lived in England in my 20s when my then-bf from Gloucester took me home for Christmas, and his mother made them, even though nobody in the family likes them. To be polite, I took some, and I actually loved them! and of course, I just noticed the typo in brussel, LOL. And that’s why you liked them. Or–oh, never mind. It was funnier in my head than it is on the screen. Pingback: What people really want to know about Britain: part 6ish | Notes from the U.K.
Pingback: Brussels sprouts at Christmas: a crisis update | Notes from the U.K. I love my Brussels sprouts! What are the club fees? No fees. All you have to do is eat them. With joy. It is one of my great sadnesses that I can’t grow Brussels sprouts in the garden. I’ve tried, but they’re tiny. It’s not that I don’t have green fingers. I do. My leeks are white and gorgeous. My beetroots are red and sweet. My sweetcorn are golden and plump. I’ve given up and get my sprouts from Sainsbury’s. My preferred cooking method is to parboil them, then fry them with sesame oil and wine. Along with Delia’s bread sauce, it’s been my contribution to Christmas lunch for many years. This year’s Christmas dinner might just be bread sauce and Brussels sprouts. The soil will only do what the soil will do. Back in Minnesota, our lettuce was bitter and I gave up on it. Our tomatoes, on the other hand, were–sigh. I still dream about them. Here I grow great lettuce (if I can keep it from the slugs and the snails and the pigeons) but the tomatoes aren’t even worth discussing. Have a good Christmas dinner. Did you know they come packaged as sweets in Waitrose and M &S now for about £4.00 (well, £3.99). Fascinating, I know! I wonder if anyone would notice if you plonked a few of those on the dinner plate instead of the vegetables …. just a thought! Oddly enough, I do know that, but only because my partner’s a sprouts hater and some friends gave her a small bag of chocolate sprouts at Christmas. So yes, just slip ’em on the plate. Everyone will be happy. Were your partners chocolate sprouts green on the outside and shaped like a Brussels sprout? If so, we may well be talking about the same thing. I don’t actually know whether the Waitrose/M&S ones are chocolate inside, but I’m presuming they are. I don’t actually know. They went from foil wrapped to gone without me ever spotting the inside. I worked in a candy factory a hundred or so years ago and lost almost all interest in eating candy. I keep meaning to say, I love the photo you use. Send the younger you my love. Was not a fan of them when first intoduced to them as an exchange student in Brighton but have grown to love them since discoving how they taste sautéed in olive oil with garlic. (Almost) anything’s better with garlic, although even I draw the line at adding it to chocolate. Pingback: What the world wants to know about Britain, part I’ve forgotten what | Notes from the U.K. I had arranged to ride my bicycle the three miles to my girl friend’s home. Mum asked me to hang on whilst hubby number two went to fetch the BSs for tomorrow’s dinner from the old lady’s garden. He had not been long gone when a knock came on the door and a strange man explained rather apologetically that he had knocked hubby #2 from his bike and was on his way to the hospital with him. Of course, Mum needed to go too which meant I had to stay in and mind my two younger sisters. Fortunately my girlfriend’s disappointment at my inordinately late arrival at her home did not prevent her saying “yes” when I popped the traditional question two days later. We are still together and will definitely be eating Brussels Sprouts this Christmas as we have always done. Great story–and the only romantic story about brussels sprouts that I’ve ever heard. Or am ever likely to. And I say that as someone who likes them and had some (cold and on toast–it’s strange but good) for lunch today.